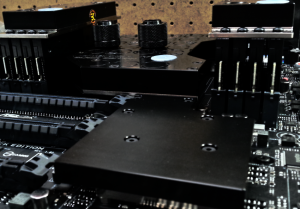 Here at Eagle Micro we pride ourselves on the quality of work that goes into each and every custom Liquid Cooling loop we build. From start to finish, we work with you to ensure the right solution, with the right look. 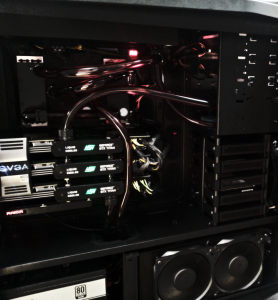 Why go with Liquid Cooling? For some, the stock air cooling will keep their components running at peak performance without issue. For others, who have invested in high performance parts or are looking to push their systems to the limits, the stock air solutions do not provide sufficient heat transfer. When PC components – particularly CPUs and GPUs – begin overheating, performance and durability will suffer a great deal. Often times these components will even throttle back to avoid thermal damage. This keeps us from achieving maximum efficiency in our computing. Liquid cooling offers a distinct advantage in thermals over air, and a price advantage over many of the extreme cooling solutions. The basic principle behind any cooling system is heat transfer: Taking heat from one object and moving it to another for dissipation. In an air cooled system, this is accomplished by heat sinks (sometimes big ones, sometimes small) and fans. The heat sink is made by a highly conductive material, then it is paired with a fan. Heat from a processor or other heat generating component flows through the heat sink, then is dissipated by a fan. Liquid cooling uses the same principle, except instead of relying solely on air to pull heat away, a coolant is used to remove heat from a component. Since liquid has a much higher thermal conductivity, and much higher thermal capacity, it can move heat away from components quicker and more efficiently than air. The coolant flows over a water block, then passes through a radiator, much like the one found in your car’s engine compartment. The concept is basic, but the results are drastic. Under stressful conditions, we have seen high performance systems show a 40 degree Celsius drop in component temperature after switching from stock to custom liquid cooling. That’s over 100 degrees Fahrenheit! You can imagine the performance gains and component stability achieved by that sort of temperature difference. Not only that, components will last longer as they are kept from heat extremes. We use the highest quality parts, because second best is not advised when water and electronics are running in concert. Our systems are put through a rigorous, 48 hour leak test before being allowed to leave the shop. No one benefits from leaks, so we want to ensure an air-tight loop. Our technicians see each build as a work of art, and we can guarantee you will see our passion and drive as we build your masterpiece. Before any of this can get rolling, we highly recommend bringing your system in and sitting down with us. We will go over options, pros and cons, expectations, costs and time frame. Each build is unique, so we like to get measurements and a solid game plan before moving forward. Once we have our game plan, a down payment is required so the parts order can be placed. Some prefer to hold on to their systems while we wait on parts arrivals, others like to put it in for service from the start. We are flexible either way. When parts arrive, we will inform you if you’ve opted to take the computer home after the initial inspection. When your custom loop’s hardware arrives, we get to work immediately. The process involves a lot of disassembly, cleaning and preparation. We keep you up to date with progress photos and are always happy to take calls if you have any questions during the build. 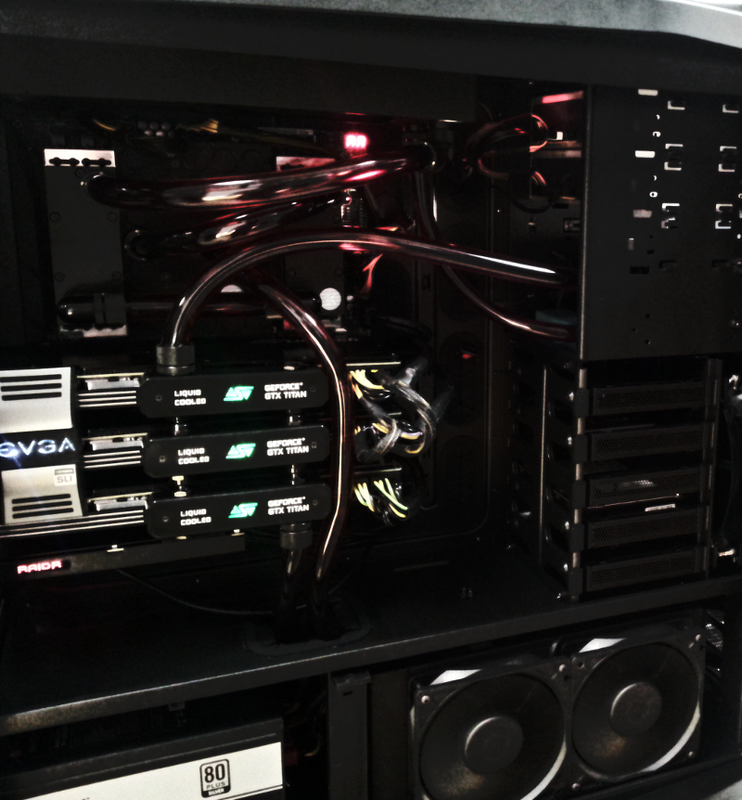 After your loop is completely built and filled, we being the testing process. Your PC is never powered on until we are 100% confident the new cooling solution will not leak. 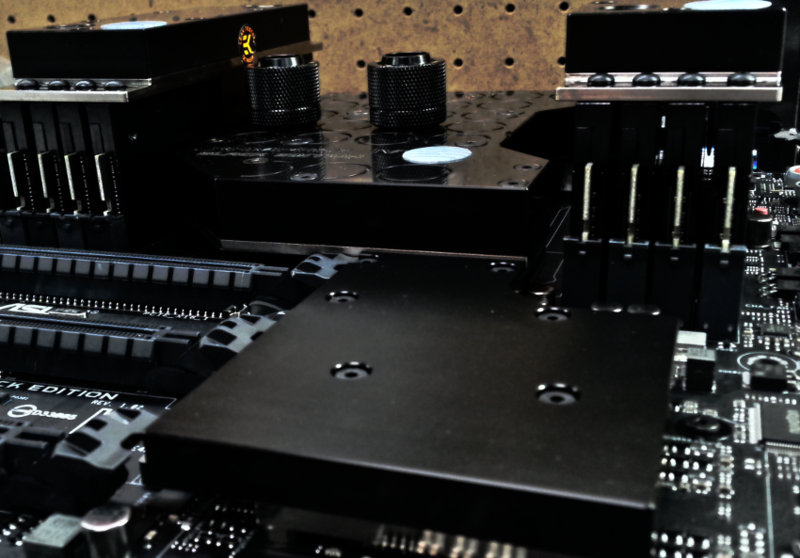 We twist, turn and torture the water cooling loop to ensure the system has integrity. The idea behind our process is making sure your cooling system not only survives the ride home, but the years of use you plan to get from it. Finally, after the build, fill, stress and endurance tests, your computer is ready to leave our shop. We have you come in for a final inspection and to make sure there’s nothing you’d like addressed prior to completion. We will also advise you on recommended maintenance to keep your build in peak condition.